Aladdin (Ryan Carlo) and Princess Adora (Ariana Kruszewski). Photo by Sarah Straub. Adventure Theatre is living up to their name with this wild journey through a beloved story. This isn’t Walt Disney’s Aladdin though. ATMTC is striving to return to the roots of this epic tale about love, magic, and the heart of a child. The show is a blast. Based on “Aladdin and the Wonderful Lamp” by James Norris, the story follows young Aladdin (Ryan Carlo Dalusung) as he faces an evil magician (Ahmad Kamal). Aladdin gets a lot of help from princess Adora (Ariana Kruszewski) and, of course, an outrageous genie (Scott Ward Abernethy). Dalusung’s Aladdin was Peter Pan-like. His spritely energy carried throughout the entire show. His inquisitive nature was charming. Kruszewski’s Adora, who wanted a simpler and happier life, was so sweet and playful. Kruszewski made an excellent partner of Dalusung and their innocence made the show endearing for audience members of all ages. Kamal played a wonderfully sneaky magician who was not too much of a caricature, which was refreshing. He was a slimy bad guy who just wanted some power, no matter what the costs. Abernethy technically played two genies and he was really able to show off his versatility. Both were larger than life characters but in their own distinct ways. Abernethy played both effortlessly and carried himself with contagious enthusiasm. The rest of the cast was rounded out with Thony Mena (Sultan), Francesca Marie Chilcote (Aladdin’s Mother), and Ariana Almajan who played multiple characters but mostly the narrator of the story. 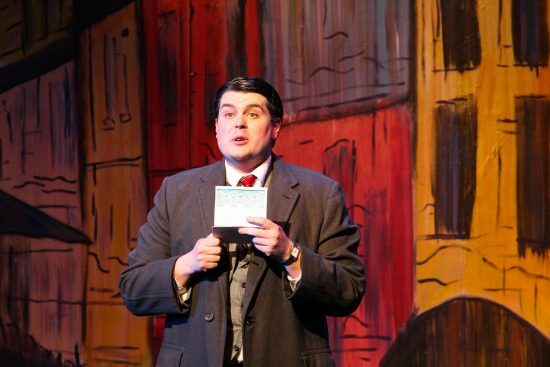 This ensemble worked incredibly well on stage. Roberta Gasbarre directed in a tasteful and culturally appropriate way. The cultural offices of Egypt, Oman, Qater, and Morocco gave the production team support. They integrated shadow puppets, like those traditionally associated with the Middle East and large puppets based on the traditions of Uzbekistan. The puppets were designed by Dre Moore. Dr. Laurel Victoria Gray acted as the movement consultant for the show. The way all of the actors moved about the stage was reminiscent of the swirling sands of a desert. This was a wonderful little detail that made scenes and especially transitions fascinating to watch. It was a powerful reminder of the ethereal nature of storytelling and theatre. Hana Sooyeon Kim designed the set, which looked like layers of hanging tapestries. It was similar to stepping into an open air market. These “tapestries” were also often covered with projections which made of a beautiful effect. The most striking part of the set, however, was the beautifully painted floor. It was swirling shades of various earth tones and looked just like the windblown sand. The amount of detailed painting was striking. The show is a blast. It gives audience members of all ages the chance to explore what happens when you allow yourself to believe in a little bit of magic. 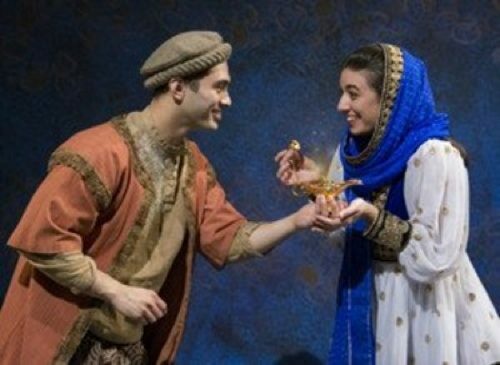 ‘Aladdin and the Wonderful Lamp’ runs at Adventure Theatre MTC Academy through May 21. For tickets and more information click here.